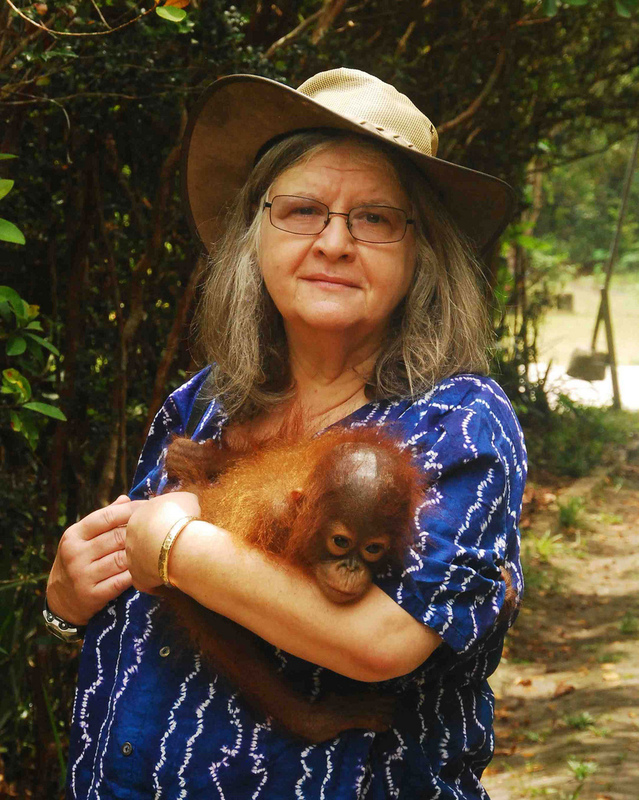 Orangutan Foundation International Canada’s main mission is to support and continue the orangutan and forest conservation efforts initiated by Dr. Biruté Mary Galdikas in Kalimantan (Indonesian Borneo). Orangutan Foundation International (OFI) under the leadership of Dr. Biruté Mary Galdikas established the Orangutan Care Center and Quarantine (OCCQ) facility in 1998 in the village of Pasir Panjang, near the town of Pangkalan Bun, Central Kalimantan. 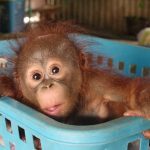 The OCCQ was created for confiscated ex-captive orangutans needing medical and other rehabilitative care in preparation for release into the wild. 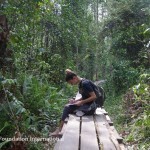 The OCCQ is a joint program of OFI and the Indonesian Forestry Department and its programs are supported by OFIC. The OCCQ is located within 80 hectares of relict primary peatswamp forest where many of the orangutan orphans are released daily. This forest provides a type of “jungle school” where orphans can learn locomotion in the forest canopy and nest-building skills as well as foraging techniques. Within the forest are small facilities that allow some of the orangutans and their caregivers to sleep in the forest at night. 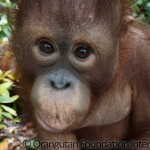 The existence of the OCCQ enables Indonesian wildlife officers, police, OFI staff and concerned individuals to bring confiscated, sick, and injured orangutans (including wild orangutans) to a facility in Central Kalimantan capable of providing a high standard of medical care, and the potential for eventual release back into the wild. 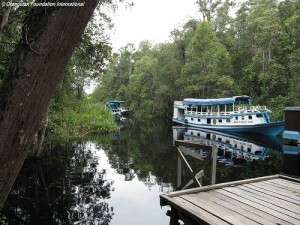 Camp Leakey was established in 1971 by Dr. Biruté Mary Galdikas and former husband Rod Brindamour, in Tanjung Puting Reserve, now a designated national park in Central Borneo (Kalimantan Tengah). It was named after the legendary paleo-anthropologist, Louis Leakey, who was both mentor and an inspiration to Dr. Galdikas as well as Drs. Jane Goodall and Dian Fossey. Originally consisting of just two huts, Camp Leakey is now an assemblage of permanent structures designed to provide a base for OFI’s staff, research assistants and Park Rangers. Wild orangutan research continues to be conducted by OFI staff on a daily basis, as a part of the longest running study of any mammal in history. Over the years, Camp Leakey has also supported the research efforts of dozens of Indonesian and international scientists and students including undergraduate and graduate students from Univeristas Nasional & Universitas Gajamada. Many have gone on to receive their Ph.D. degrees. Projects have ranged from orangutan, proboscis monkey, gibbon and leaf-eating monkey behavior and ecology, to studies of orangutan sign language abilities and cognition, leech behavior, and river system ecology. Aside from orangutan research and rehabilitation, Dr. Galdikas and OFI directly conserve orangutan rainforest habitat by purchasing local forests which are under threat of annihilation. These forests are purchased as potential sites for the daily or permanent release of wild born ex-captive orangutans as well as to protect remnant wild orangutan populations. Land is also purchased to act as corridors between forested areas and to protect the area from the encroachment of palm oil plantations, timber estates, and other destructive developments. 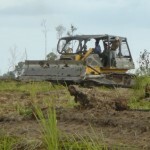 There is a current campaign to raise funds for a 2600 ha forest called the Rawa Kuno Legacy Forest. This forest contains relict primary forest, rivers, lakes, much wildlife, and an estimated remnant population of wild orangutans of approximately 100-200 individuals. Please watch our video and consider donating to protect this tropical heath and peat swamp forest forever.